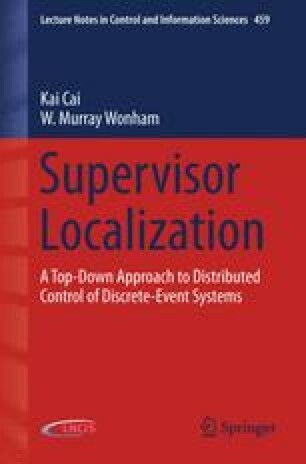 In this chapter, we address the question of how to solve the distributed control problem for large-scale discrete-event systems, where the monolithic supervisor might not be feasibly computable owing to state space explosion. First, we introduce an efficient heterarchical supervisory control synthesis, the key technique of which is model abstraction. Then we propose to combine supervisor localization with the heterarchical synthesis in an alternative top-down strategy: first design a heterarchical array of decentralized supervisors and coordinators that achieves global optimal and nonblocking control, then decompose each of these supervisors/coordinators into local controllers for the relevant component agents. We call this procedure heterarchical supervisor localization, and demonstrate it with the benchmark example of automated guided vehicles serving a manufacturing cell.